Society: The Basics utilizes a complete theoretical framework and a global perspective to offer students an accessible and relevant introduction to sociology. John Macionis, author of the best-selling Introductory Sociology franchise over the last three decades, empowers students to see the world around them through a sociological lens, helping them to better understand their own lives. Informative as well as engaging, Society: The Basics will change the way readers see the world, and open the door to a new perspective and new opportunities. In addition to extensively updated data, the Fourteenth Edition offers engaging discussions of hot-button contemporary topics such as the increased proliferation of social media as well as expanded coverage of race, class, and gender. 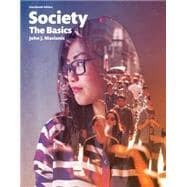 Society: The Basics, Fourteenth Edition is also available via REVEL™, an interactive learning environment that enables students to read, practice, and study in one continuous experience.